When travelling, sometimes its life’s simple comforts from home, that you miss the most, whether it be your own bed, or a nice roast dinner. Living life on the road, doesn’t mean you need to miss out on quality food. Ranger Nick has supplied us with some of these quick and easy recipes, that you can make on the road, providing you with the perfect mix of home & lifestyle! We recently tried this menu at the annual Relish Food & Wine Festival in Maryborough, and we can confirm they are not only simple, but delicious! Chuck S/R flour in a large mixing bowl, make a dam, Slop cream, beaten bum nut, salt, raw sugar and ginger beer on top. Fold mix in until all flour is bound together. 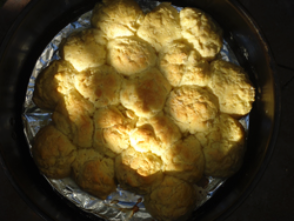 Lay tin foil inside oven, on top of trivet, powder with flour, break off table spoon sized lumps of dough, roll into ball, roll it round in a bit of flour, and drop them into a pre-heated camp oven, brush a bit of milk over the top. Allow to bake for about 15 min. Just a little tip, handle the mix as minimal as possible. 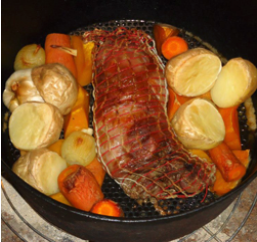 Plonk the lamb on a trivet into a sizeable camp oven, hack up veggies, (not to small) excluding the garlic bulb (the garlic bulb goes in hole, as seen in complimentary picture) and place them all around the outside of the roast to be. Avoid veggies touching the sides of the camp oven as this may cause some burn to veggies. The garlic bulb, well, each clove can be broken off and squeezed to reveal a delicious sauce. Cook time 2-2 ½ hours. Dress prawns, heat butter in a hot pan, add garlic, chives and chilli to taste. 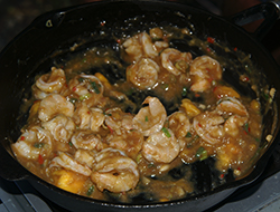 Toss in prawns, add ¼ cup of brandy and set alight (FOOFA) this will burn of alcohol and stop the bitter taste. Add a small tub of cream, bring to the boil, then set aside to thicken. Eat as finger food, serve with a bed of rice or pour over steak or fish.